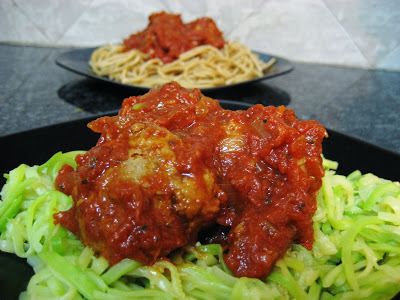 Healthy Meatballs and Spaghetti - No Way That's Healthy! I’m sure you have been anxiously waiting to hear what today’s recipe will be. And since I am super nice I didn’t make you wait long. Honestly, it’s so good I felt bad not sharing it with you yesterday. 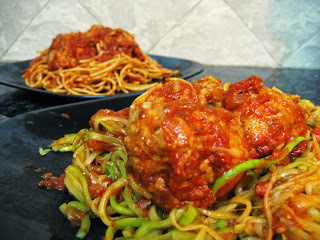 I have never liked meatballs and spaghetti, ever. I don’t know what I didn’t like about it, but I just didn’t. That is, until I made this recipe. 1- Homemade tomato sauce means you control what goes in it. No need for nasty fillers and preservatives in the store bought versions. 2- Instead of 100% ground meat. This recipe uses 50% meat and 50% turkey. Ground turkey is much healthier and you can’t even tell it’s there. 3- Instead of breadcrumbs I use oat flour. Oat flour is just oats that have been blended till it forms a flour consistency. The oat flour also give it a perfectly smooth and soft texture. 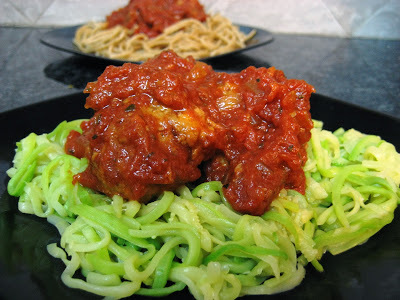 4- Use my zucchini spaghetti instead of wheat spaghetti for a lower carb/calorie version. You can also do some wheat pasta and some of the zucchini to bulk it up. Heat oil in large pot. Add in onion and saute till soft. Then add in garlic and cook a little longer till fragrant. Add in crushed tomatoes, tomato paste and spices. Stir till combined. Bring to a boil. For the meatballs, mix together the ground meat and ground turkey. Don’t over mix, just enough till mostly together. Then add the rest of the ingredients and mix again. Let it sit to firm up a bit. You can now form them into any size you want. Here I made them into 14 large meatballs. Place them into the boiling sauce and make sure each one is covered in the sauce. Cover and let cook for 45 minutes on low heat. Check on it once or twice during the cooking and give it a gentle stir. Serve over whole wheat spaghetti, zucchini noodles, or even brown rice. 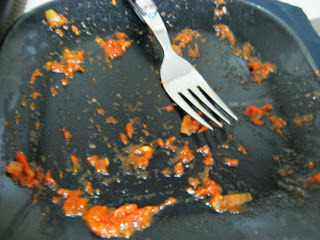 And I must tell you- my husband was very unhappy when I told him to leave some sauce on the plate for the picture below. Oh, and as I was taking the picture he was eating the rest of my zucchini spaghetti. Important note: First of all you will be so surprised at how filling this is even when using the zucchini noodles. Second- Double this recipe! My only regret is that I only made one batch. It is that good. And it also freezes well. you can add peppers and carrots to the sauce, after you saute the onion. oh, and spices should definitely include basil and thyme, maybe sweet paprika… and adding a little red wine never hurt anyone. It is time for me to fill my freezer and this sounds like a great recipe. Oat flour sounds better than bread crumbs- healthier anyhow. Question- ain li oat flour. Would I just put old fashioned or quick oats in a food processor? yup! I wrote above- 3- Instead of breadcrumbs I use oat flour. Oat flour is just oats that have been blended till it forms a flour consistency. The oat flour also give it a perfectly smooth and soft texture.